When Donald Trump rode to victory in the Electoral College on Nov. 8, perhaps no group was more surprised than journalists, who had largely bought into the polls showing Hillary Clinton was consistently several percentage points ahead in key swing states. But there may be another reason they didn’t see it coming: Journalists spend a lot of time on Twitter, and their information bubble rarely includes Trump supporters. That’s according to a new analysis from the Electome project at the MIT Media Lab provided exclusively to VICE News. MIT’s analysis — which used the social media company’s complete data set — shows that on Twitter, Trump supporters formed a particularly insular group when talking about politics during the general election. They had few connections to Clinton supporters or the mainstream media. By contrast, Clinton supporters were more splintered and verified journalists often overlapped within their mutual follower networks. The data cannot draw any definitive conclusions about why Twitter users became so polarized during the 2016 campaign, but it does provide a striking look at how they did. Perhaps journalists’ more Clinton-oriented Twitter networks expose a subtle form of political bias, or perhaps Trump supporters separated themselves from these users to avoid inconvenient facts. In the United States, people tweeted 1 billion times about the 2016 election from August 2015 through Election Day (Nov. 8), according to Twitter. The volume of conversation — including from the candidates themselves — provided MIT with a treasure trove of data to mine on how Americans discussed one of the most contentious presidential races in history. Electome found that following either Trump or Clinton on the social media site was a reliable indicator of support for that candidate. 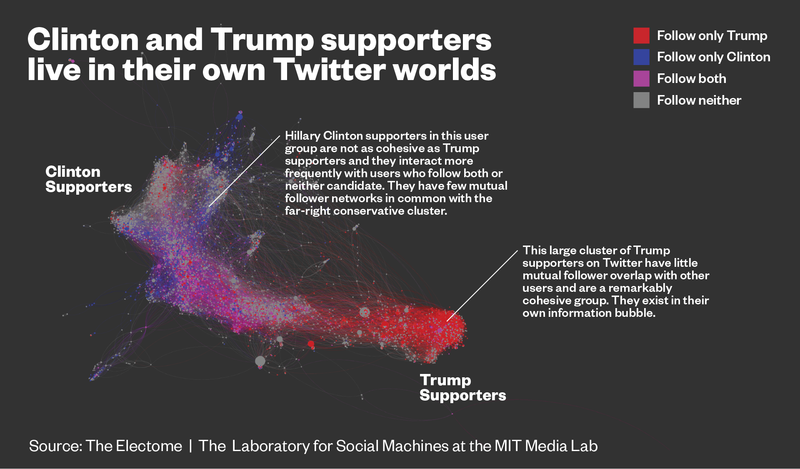 Two researchers at the MIT Media Lab independently analyzed hundreds of exclusive Trump and Clinton followers to score their level of support for the candidates. “In almost all cases, being an exclusive follower of a candidate was predictive of support for that candidate,” said Soroush Vosoughi, a postdoctoral associate at MIT’s Laboratory for Social Machines who worked on the project. As you can see from the images, that support had an effect on a user’s information flow as people seemed to cut themselves off from users who supported a different candidate. Electome used its machine learning algorithms to measure all political conversation from June 1 to Sept. 18 this year on topics including guns, immigration, terrorism, jobs, racial issues, seniors and Social Security, the economy, and education. The group first searched for what it called “high-precision” terms and hashtags such as “2nd Amendment” and “#buildthewall” that clearly related to specific topics like guns and immigration. From there, it used those words to teach its classification system to expand the possible terms and hashtags that could relate to certain issues, including misspellings of them. Vosoughi said Electome also took pains to follow the political conversation in real time in order to make its issue categories as precise as possible. “Since the conversation around the election is very dynamic and new terms and phrases are brought into the conversation constantly, our system automatically re-trains itself once a week so that it is aware of the most up-to-date terms and phrases,” he said. The data scientists constructed a network of all the mutual followers around each issue, filtered out users who were likely trying to get followers by following lots of others accounts, and then ran a PageRank algorithm to determine the 50 most important users in the conversations about each topic. From there, Electome plotted those 50 users and their followers on maps showing the political conversation. The maps do not show the entirety of the 1 billion political tweets this cycle, but the visuals offer a sophisticated representation of that network. There’s a strong caveat to all of this: Twitter users are a self-selecting subset not necessarily representative of America. The data does not include conversation on Facebook, for example, which reported that 128 million people in the U.S. used their social platform to talk about the election from March 23, 2015, through Nov. 1 this year — a slightly longer window than Twitter used for its calculations. These Facebook users either liked, posted, commented, or shared things about the election. Still, Twitter is a large network of 67 million active monthly users in the U.S. that can become a vibrant and often caustic political forum. Electome’s results suggest that even as voters have instant access to more information and perspectives than ever before, they segregate themselves into clusters of like-minded people often with little connection to those with other views. Journalists were just as guilty as the partisans of separating themselves. By culling through verified users, Electome mapped out where a lot of journalists fell within the conversation and found that they were mostly disconnected from Trump supporters. This could help explain why many journalists were caught off guard by the depth of Trump’s support — and why the soul-searching in the media continues long after Election Day. Watch a VICE special report on bipartisanship, “A House Divided,” Friday, Dec. 9, at 10 p.m.